Clocks Numerals, Plastic Dots 3/16"
Gold tone plastic dots 3/16 of a inch diameter. Clocks Numerals, Plastic Dots 3/8"
Gold tone plastic dots 3/8 (8 mm)of a inch diameter. Gold tone plastic dots 5/8 (16 mm)of a inch diameter. Gold tone plastic dashes 3/8 (8 mm)of a inch diameter. Gold tone plastic dashes 5/8 (16mm)of a inch diameter. Gold tone plastic dashes 3/4 (19mm)of a inch diameter. Clocks Numerals, Plastic Roman Numerals 3/8"
Gold Tone Plastic with Black Trim. 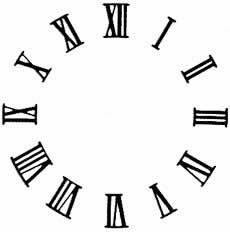 Roman or Arabic Numerals sets are available in 3/8", 1/2", 5/8", 3/4", 1" and 1 1/4".